Grace Nichols has published many books for both adults and children. Her first poetry collection, I Is A Long Memoried Woman, won the 1983 Commonwealth Poetry prize. Other collections include Picasso, I Want My Face Back and I Have Crossed An Ocean, both published by Bloodaxe. 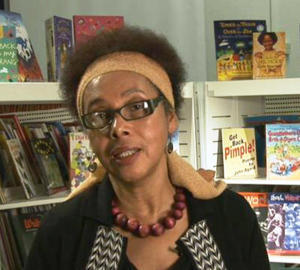 She was poet-in-residence at the Tate Gallery, London and is among the poets on the GCSE syllabus. with a great faith and a great surrender. adopting the inner stillness of the lotus posture. swarm or fly around you. You are in the hands of the great mother. you cross a street forever. against an old flint wall. sticking his conker-eyes back in. up and rustling to the vein.